DAF Anti-Bacterial Laminated Mattress Ticking Fabrics are fluid-proof, flame resistant, anti-fungal and mildew resistant. 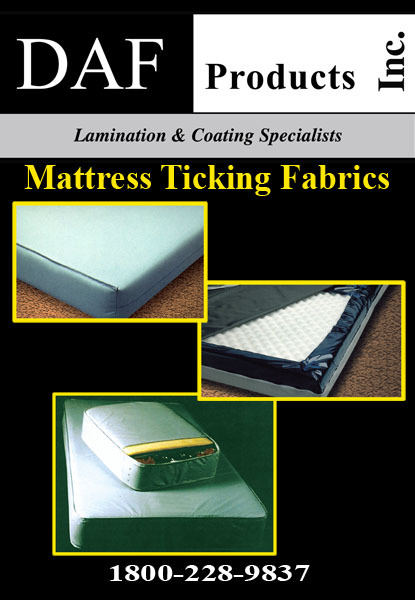 They are the ideal fabrics for mattresses used in hospitals, nursing homes, correctional institutions, school dormitories, and other institutional applications. DAF AB is also used extensively for the bottoms of higher end mattresses, hospital pads and wheelchair cushions. DAF AB comes in widths from 7/8” to 96”. DAF AB 8-1 is a light weight reinforced polyvinyl chloride laminated mattress ticking fabric. 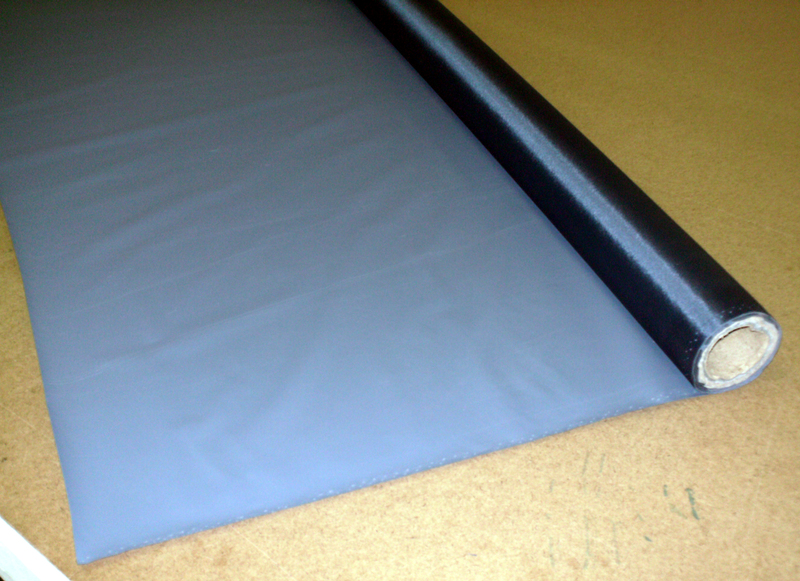 The 18x9 polyester reinforcement provides greater stability. It comes with two embossings, suede and taffeta. The standard color is grey. Custom colors are available on request with a minimum order. DAF AB 9-9 is an economical polyvinyl chloride, 9x9 polyester scrim reinforced mattress ticking laminated fabric. The standard color is light green. Custom colors are available on request with a minimum order. DAF AB 10-1 is the most economical reinforced polyvinyl chloride laminated mattress ticking fabric. The 18x9 polyester reinforcement provides greater stability. The standard color is light green. Custom colors are available on request with a minimum order. DAF AB 10-IL is a polymeric polyvinyl chloride 18x9 polyester scrim reinforced mattress ticking laminated fabric. This fabric is foam compatible. DAF AB 10L is more resistant to cracking due to cleaning. The standard color is tan. Custom colors are available on request with a minimum order. DAF AB 10-1C is a three-ply polyvinyl chloride with a 18x9 polyester reinforcement with a conductive coating. The conductive coating controls electrostatic and static charges. Our standard color is black face with a light blue back. DAF AB 10-6 Clear is an economical polyvinyl chloride/polyester scrim reinforced mattress ticking laminated fabric. It is an ideal fabric for mattresses used in correctional institutions so contraband can be seen. DAF Products can also make the AB 10-6 Clear in a polymeric version in customized widths. DAF TPE is a PVC-free coated nylon. DAF TPE is a 70 denier nylon taffeta fabric backed by a TPE film. It combines the low cost of vinyl-backed fabrics, while staying PVC-free. DAF TPE is easy to cut and sew, and is water resistant and flame retardant. DAF TPE with its unique nylon/TPE combination is soft and pliable and an ideal candidate for the healthcare and institutional pillow, pad, and cushion markets. The look, feel, and performance of this healthcare fabric is almost identical to the more expensive neo-butyl rubber-backed products but available at a fraction of the cost. DAF Shield is a non-plasticizing, rubber-backed nylon fabric, designed to protect inner foam mattresses from the known degradation effects of plasticizer migration. Specifically designed with an extremely low Moisture Vapor Transmission rate (MVT), DAF Shield protects your valuable inner mattress against potential damage caused by leakage of water vapor and body fluids through the fabric and into the mattress itself. DAF Shield is fire-resistant, antibacterial and very easy to work with. The standard color is navy blue. The standard width is 58”. Custom colors are available on request with a minimum order. DAF RoyalTouch 870 is a nylon/PVC fabric with a 70 denier nylon backed with a strong PVC film. Royal Touch 870 is easy to cut and sew. It is water resistant and flame retardant. The look, feel, and performance of this healthcare fabric is similar to the more expensive neo-butyl rubber-backed nylons but available at a fraction of the cost. DAF Royal Touch 870 comes in 58”. The standard color is navy blue. Custom colors are available on request with a minimum order. 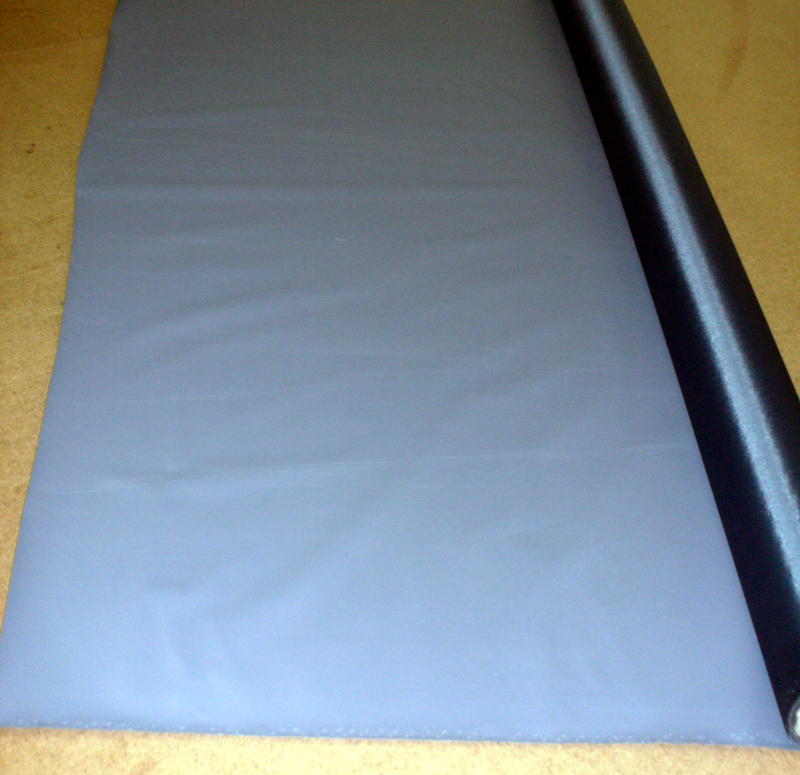 DAF TPU fabrics consist of a nylon taffeta outer fabric, coated with a layer of thermo plastic polyurethane underneath. The finished fabric is air holding and RF weldable. DAF TPU fabrics are flame-resistant and easy to clean with soap and water. DAF TPU is well-suited for healthcare air holding applications. DAF 70D TPU comes with a 70 denier nylon outer fiber. For additional strength, DAF 210D TPU is made with 210 denier nylon. The standard width is 58”. The standard color is navy blue. Custom colors are available on request with a minimum order. DAF Breathable Fabrics consist of a nylon taffeta outer fabric coated with a layer of polyurethane underneath. They are breathable and water/moisture resistant. Our light weight versions of this fabric can be used for pillows while the heavier versions are suitable for cushions and pad. The standard width is 58”. DAF Breathable 170 consists of a 70 denier nylon taffeta outer fabric coated with a thin layer of polyurethane underneath. Breathable 170 weighs 2.0 oz per square yard. Standard colors are yellow, aqua, and light blue. DAF Breathable 270 consists of a 70 denier nylon taffeta outer fabric coated with a double layer of polyurethane underneath. Breathable 270 weighs 2.5 oz per square yard. The standard color is navy blue. Custom colors are available on request with a minimum order. DAF Breathable 2210 fabric consists of a 210 denier nylon oxford outer fabric, coated with a thin 1.5 mil layer of polyurethane underneath, ideal for use in healthcare mattresses, pads, and cushions. With an overall thickness of .008”. The standard color is navy blue. Custom colors are available on request with a minimum order. DAF SuppleKnit Fabrics are high performance pressure-reducing health care fabrics that consist a transfer coated polyurethane with a stretch polyester knit fabric. They are soft, breathable, antibacterial, and mildew resistant. They are designed to reduce patient interface pressures and simultaneously promote healing via the active evaporation of water and cooling at patient pressure points. DAF SuppleKnit S is a light- weight pressure-reducing fabric ideal for health care pads and cushions. Standards colors are navy and black. Standard width is 58”. DAF SuppleKnit F is a medium-weight extra strength pressure-reducing fabric ideal for mattresses, pads, and cushions. Standard colors are navy and black. Standard width is 58”. DAF SuppleKnit V is a heavy-weight pressure reducing fabric ideal for mattresses, pads, and cushions. The standard color is royal blue. The standard width is 58”.